Penberthy offers one of the industry’s most complete lines of sight flow indicators and sight windows with our FLUIDVISION™ product line. They include ANSI, Teflon®/Tefzel® lined, FM approved dual-window, armored, full-view, threaded window and low-flow gaseous models. 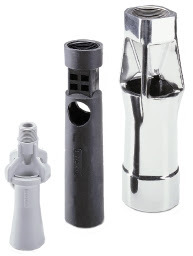 All popular sizes and materials of construction available, with flanged, threaded and special connections, as well as rotator, flapper, drip-tube or plain indicator styles. Also includes threaded, oblong and conventional sight windows. For common process flow stream pressures, use the industry standard. 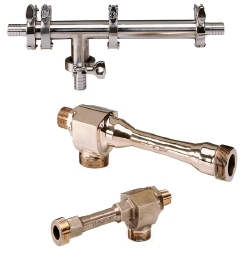 Available in NPT threaded-end and flanged designs, these Sight Flow Indicators meet most standard installation requirements. Made from single-piece, cast-construction bodies, these SFI's are available with all five styles of Penberthy indication. Ball type indicators should be mounted in a vertically upward or horizontal flow orientation. Standard sizes from: 1/4" to 3"
Standard sizes from: 1/2" to 3"
Powerful flow streams are mastered by heavy-duty construction. Available in flanged models only, these Sight Flow Indicators meet tough ANSI standards for 300# and 600# requirements. Made from single-piece, cast-construction bodies, these SFIs are available with all five styles of Penberthy indication. High Pressure Sight Flow Indicator Applications . Naturally occurring high pressure wells (natural gas, petroleum, geothermal steam) and long distance pumping (transportation) of liquids and gases require High Pressure Sight Flow Indicators to observe fluid dynamics. Chemical processes often require that fluids be in their liquid state. To achieve this the chemical must remain under pressure at all times so that it can be transported using high pressure pumps. Observing the flow of chemicals such as Argon, Hydrogen, Nitrogen, Oxygen, Carbon Monoxide, Propane, Ethyl Methyl Ether, Butane, Isobutane, Pentane in their liquid state requires High Pressure Sight Flow Indicators. Power Piping - Steam electric generation stations; industrial and institutional plants; central and district heating plants. Petroleum - Petroleum refinery piping; loading terminal; gas metering; main and service lines; bulk plant and compressor stations compounding plant; storage facilities; gas pipelines. Pharmaceutical/Chemical - Alkylation/carboxylation; dehydration/halogenation; condensation/cyclization; other complex chemical conversions. Standard sizes from: 1/2" to 8"
For common process flow stream pressures, use the industry standard -- Penberthy Precision Liquid Level Monitoring Instrumentation. Pumping liquids using a liquid or gas (steam) motive is one of the most recognized uses of Penberthy jet pumps. These units can also be used for blending, evacuating, exhausting and priming. These units are self-priming, have no moving parts and provide a very simple cost effective method of handling a wide variety of liquids and processes. These units are used for all aspects of water treatment, refrigeration, petroleum, petro chemical, mining and general process industries. 1/2A LH SS Stainless Steel half inch LH series in SS ( 56835-030 ) $ 375.00 Click to Order. The world’s leading line of eductor/ejector products perform everything from pumping liquids and slurries, moving granular solids, draining sumps and evacuating vessels…to heating liquids or agitating/mixing them in tanks…to mixing a second liquid into a flowing pipeline. In every case, Penberthy Jet products are doing the job better and more reliable than more complex – and costly – conventional pumping and mixing systems. Penberthy circulating tank eductors, also known as in tank mixers provide a low cost alternative over other more expensive mechanical mixers. These units provide a more thorough mixing action then either mechanical mixers or air sparging. The flow pattern is easily controlled and provides a more complete integration of substances in a wide variety of liquids. These units are used in a wide variety of industries, including petroleum production, food processing, chemical processing, distilling, brewing and many others.